A small and an accommodating cafe where upon stepping in you can feel that the air is full of rich aroma, with light music setting all the chords dancing and friendly attitude of the hosts automatically making you comfortable. If you wish to take a halt when you are around then make sure you drop in at the café to relax and eat till you are satiated. The décor has nice historical pictures on the walls while the menu offers you all sorts of sea food, vegan dishes and some nice wines to choose from. It’s a nice, entertaining and cool place to be at after your doze of sightseeing. 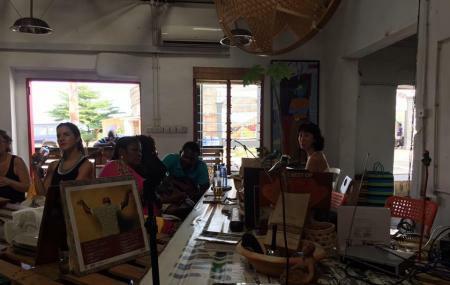 Explore Jamestown Cafe and other prime spots of the city using Accra trip planner. You can add cozy hotels in Accra like Valleystreams Hotel, Urbano Hotel and Roots Apartment Hotel. There are plenty of ready-to-book Accra vacation packages available that will cover the major attractions, accommodation concerns including the prime one like how to reach Accra. Nice and cozy place to be with group of friends,live music,great food and friendly bilingual staff. The owners are amazing and friendly!!! A real culture experience giving you a mixture of urban and rural vibe. Always has a mixpot crowd of locals and foreigners. Small menu, but good food. It's a cafe that organizes weekend events to sensitive people and discuss diverse topics.